It is widely known that a lack of access to fresh, healthy foods can contribute to poor diets and higher levels of diet-related diseases. In the case of brain health, we know that everyone who has a brain is at risk of developing Alzheimer’s disease, with the greatest risk factors being aging and genetics. But there is growing evidence that other risk factors may also result in declining brain health. The lack of a healthy diet increases the likelihood of chronic medical conditions like hypertension, obesity and diabetes, and these diseases increase the likelihood of cognitive impairment. Nearly half (45 percent) of all Americans suffer from at least one chronic disease; and more than 1 in 4 Americans have multiple chronic conditions. For many of these health conditions, black people have higher risk factors, occurrences, morbidity and mortality rates than whites. As the nation’s population ages, we should stop viewing chronic disease as simply a normal part of growing older. Our environment influences our health. In my role as leader of the National Working Group on Food & Health Equity at the Food Trust, a nonprofit organization working to increase access to healthy and affordable foods, I’m particularly interested in reducing racial and ethnic health disparities and focusing on understanding how other social factors intersect with food and influence our health. Evidence shows that a diet rich in vegetables, especially green leafy vegetables, is associated with better health and a reduced rate of cognitive decline. Studies (pdf) also show that people who ate a Mediterranean diet (fresh fruits and vegetables, nuts, fish and olive oil) had a 28 percent lower risk of developing mild cognitive impairment, and a 48 percent lower risk of such impairment progressing to actual Alzheimer’s disease. 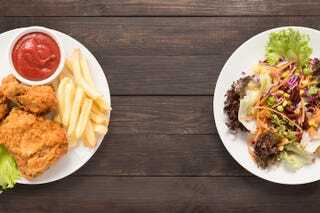 Simply put, the better the food a person eats, the lower his or her risk for diet-related chronic diseases and the increased likelihood for a healthy brain. And conversely, a diet consisting of unhealthy foods can be detrimental not only to our physical health but also to our cognitive health. According to the U.S. Department of Agriculture, an estimated 40 million Americans live in neighborhoods without easy access to fresh, affordable and nutritious food options. This problem impacts residents of both urban and rural and tribal areas—especially those living in lower-income areas and communities of color. In general, poorer areas and communities of color have fewer fruit and vegetable markets, leaving African-American and Hispanic people less likely than whites to eat fruits and vegetables each day. And, as a result, lower-income and African-American and Hispanic people have higher episodes of diet-related diseases such as obesity, hypertension and diabetes. Evidence is showing that if left unchecked, these diseases can also increase a person’s risk of developing and increasing the progression of dementia. At every level—local, regional, state and federal—there are examples of community residents, business owners, advocates and policymakers coming together to find innovative solutions to strengthen access to healthy food. One program to support the development of fresh-food retail, Healthy Food Financing Initiatives (pdf), has a proven track record of helping to grow grocery stores and other healthy-food retail in underserved communities across the country while creating jobs and improving health. Organizations like the Food Trust, Robert Wood Johnson Foundation and the American Heart Association have teamed up with local community groups across the nation to help advance policies that reduce health disparities and promote health equity through the Voices for Healthy Kids initiative. We are partnering with groups like the NAACP, Safe Routes to School National Partnership, MomsRising, Alliance for a Healthier Generation, Balm in Gilead and many others to tackle multiple social determinants of health because neighborhoods with access to healthy food and safe places for physical activity should be a right, not a privilege. Across the country, there are a dozen states with active campaigns to create healthy-food finance initiatives. Please urge your elected officials to prioritize the issue of inequitable food access in low-income, underserved areas and adopt programs and policies that have been proved to bring fresh, healthy and affordable food to underserved neighborhoods. As one study demonstrates, produce consumption for African Americans increased by 32 percent when African Americans lived near a supermarket. Let’s encourage people to adopt healthier lifestyles and understand the connection between their physical health, brain health and overall well-being. And, at the same time, let’s encourage our lawmakers to endorse smart public health policies like Healthy Food Finance Initiatives that give everyone the opportunity to access better food and lead a healthy life. Dwayne Wharton is the director of external affairs with the Food Trust and a participant in the Allies for Reaching Community Health Equity Public Voices Fellowship with the OpEd Project. Follow him on Twitter.